Pumpkin season is upon us. Piles of pumpkins greet us at the grocery store entrance. Ads for you to come to a pumpkin farm and pick your own seem to be everywhere. And recipes for foods and beverages with actual pumpkin or some flavoring meant to mimic it are equally numerous. So a few options for adding your own touch of pumpkin are in order here with the hope that they will spark more ideas of your own. You can go as wild or tame as you prefer. Some of us go truly “pumpkin crazy” at this time of year while others exercise restraint. It’s sort of like those who add a few dashes of Tabasco sauce to their food and those who go for just a pinch of salt or even a little chili powder. 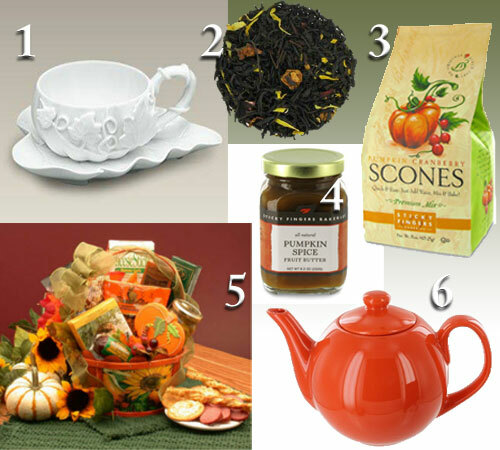 On the mild end you can have a nice cuppa English Breakfast tea in a pumpkin shaped teacup (#1); on the wilder end of the scale you can serve up pumpkin flavored tea (steeped in a pumpkin orange teapot) in that pumpkin shaped teacup, bake some pumpkin cranberry scones, cover the scones with pumpkin butter, and top it all off with treats from that pumpkin themed gift basket. Pumpkin shaped cup and saucer – Cup holds 7 ounces, accented with hand applied leaves and vines; saucer is leaf shaped and measures 6 1/4″. Dishwasher and microwave safe. Pumpkin Spice Flavored Black Tea – A blend of black teas and South African Rooibos, with natural pumpkin flavoring and spicy notes of cinnamon. Perfect when served hot with milk and sugar. Scone Mix – Pumpkin Cranberry – A taste of Fall any time of the year. Made with lots of spices, rich pumpkin flavor, and cranberry pieces. Each package makes a serving size of 12 scones. Sticky Fingers Pumpkin Spice Fruit Butter – Made in small batches with all-natural ingredients. Wonderful on scones, toast, or muffins; a unique twist to traditional apple butter. Fall Harvest Snacker Gift Basket – Send all the flavors and colors of Fall this season with this beautiful hand-painted gift basket. Includes: Fall basket, Frosted autumn pumpkin cookie, Creamy vegetable cheese spread, Three Pepper crackers, 3 ounce beef salami, Stuffed olives, Honey mustard pretzels, Chamberry chocolates, Sonoma three cheese swirls, and 2 ounce caramel corn. Teaz Cafe Teapot with Stainless Steel Infuser in Bright Pumpkin Orange – Comes with a stainless steel infuser so you can brew your favorite loose leaf or bagged teas in no time. Made from stoneware, lead free, and microwave and dishwasher safe. The humble pumpkin has been an inspiration for talented potters for many centuries. A quick online search pops up hundreds and even thousands. They range from garish to rustic to refined. Pumpkins are popular for Chinese Yixing (unglazed clay) teapots – The pumpkin (nangua 南 瓜) symbolizes a wish for sons – the pronunciation of the word sounds like “boy” (nan 男). The one shown here (#1) is a true work of art. Even 2, 3, and 4 would lend that Autumn air to your tea table. The hard part is choosing which to use! And let us not forget the potential of these teapots to be transformed into a golden carriage to take us to the ball at the palace! I love Pumpkin in any food or drink! 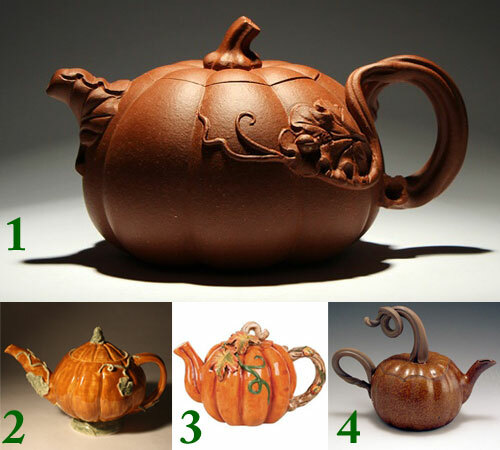 Those are lovely Pumpkin teapots too. Thanks for all of your great blogs! Thanks for reading and making us all nuts – giggle!